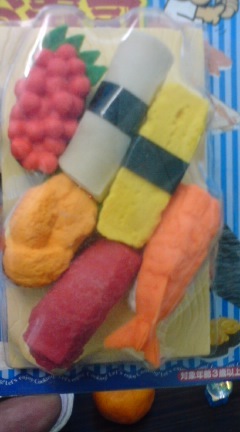 I’m alway on the lookout for gadgets representing my favourite food, namely sushi! Not very easy actually, unless I start collecting (or stealing!) 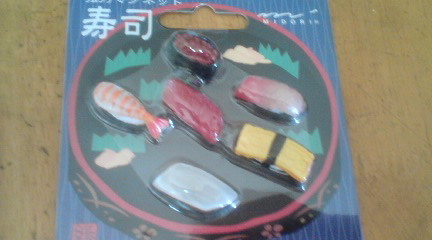 the pleastic sushi models you can find in the window displays outsie the cheaper king of sushi restaurants. Well, I found 3 of them. All ordered and distributed by Japanese companies but all made in China! Sorry for the fuzzy pictures but I don’t want to take the contents out unless I can find at least 2 samples of each! 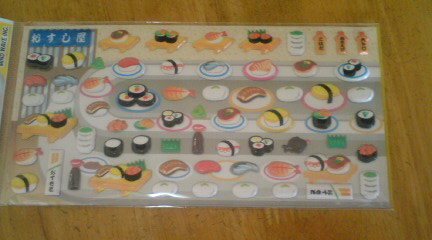 Sushi (Conveyor Belt Sushi) Stickers! If you can help with my burgeoning collection, I’ll be very grateful!